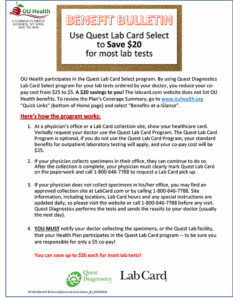 The OU Health Plan is a Plan of choice. The OU Health Plan utilizes CVS Caremark as the Plan’s Prescription Drug Manager (PBM). What is Covered? – The OU Plan covers drugs that must be prescribed by a Professional Provider, and approved by the FDA for the treatment or for specific diagnosis or condition. The drug must also be Medically Necessary treatment of the condition for which the drug is prescribed, and not Experimental and Investigational as defined in the Plan Document, unless otherwise required pursuant to an external appeal. Insulin and oral agents for controlling blood sugar are provided through the prescription drug program, as are other diabetic supplies. Generic equivalents of prescribed drugs will be provided unless specifically prohibited by the prescribing physician. If you choose to obtain a brand name drug when a generic equivalent is available, you will be responsible to pay the additional excess charges. Using the Mail Order Pharmacy. – If you choose, you may order a 90-day supply of long term or maintenance drugs through the mail order pharmacy or at your local CVS drug store. Three refills of mail order drugs may be obtained under each prescription order. Your co-pays will be less for mail order drugs than for drugs you refill monthly at the drug store. Drugs purchased through the mail order service will be sent directly to your home, postage paid. Forms for the mail order pharmacy are available in the Forms section of this website. The table below shows your co-pay for drugs, depending on the type of drug (generic, preferred or non-preferred) and whether you obtain the drug at a retail drug store, through the mail order pharmacy or at your local CVS drug store. Example below. See Plan Document for additional information. Specialty drugs Call CVS Caremark Specialty Pharmacy at 1-800-237-2767 for details. Drugs that Require Prior Authorization – Certain drugs that may be prescribed by your doctor require that the pharmacist contact the pharmacy benefit manager for verification of coverage. These drugs include those used to treat migraines, obesity, ADD, narcolepsy and arthritis, etc. The pharmacist will let your physician know if there are any authorization or limitation requirements on the prescribed drugs.